I’m sure that anyone who has been in a darkroom a handful of times knows that setting and using timers can be a hassle. I haven’t been in a darkroom since high school, circa 2007, but I do remember how we only had the big white clock on the wall to count our seconds and minutes of processing film and exposures on paper. I always got distracted by my peers or, hell, anything actually, that I would always mess up my times. I guess you get better when you’re a bit more seasoned of a darkroom master. I was recently sent a press release for an iPhone app to help make the job of darkroom timing a bit easier, allowing the photographer to focus more on their creative process than the hassle of checking timers. What intrigued me to blog about it was the fact that this is another instance of new technology being utilized to help the older technology, not taking over it. I always like to share these things because I feel that instead of pitting digital against anything analog is getting a bit old (and seriously tiring). Finding instances where they work together without compromising one or the other, now that is something to read about. 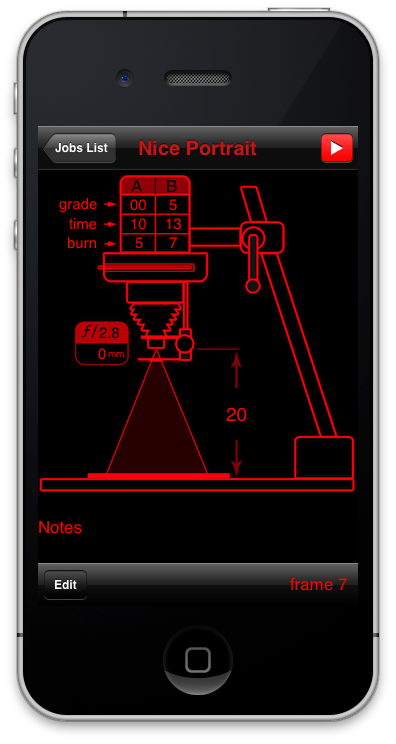 I’ve already tried the iPhone light meter app (little tool is spot on!) but I have yet to try this one because mainly I don’t have a darkroom setup yet. I have everything to set it up….just no room. 😛 So I figured I’d pass this knowledge onto my fellow darkroom dwellers. Why use DarkTimer instead of a physical timer? It’s very annoying and time consuming to set up manual timers and keep track of things for split grade processing in the darkroom. The timers need to be reset at each exposure and filter change, and it usually requires the photographer to keep notes as he goes along. Darktimer is designed to simplify the process, with multiple timers and sound alerts that will allow the photographer to focus on the creative process instead of worrying about elapsed time. Before any final print is made, it’s good practice to make a test strip to calibrate the exposure and find the correct contrast filters to use. The TESTSTRIP button fires a loop timer to help the photographer in this process. It will sound a different beep every loop, and the [+] and [-] clock steppers will increase decrease the timer. After finding the correct exposure times for each filter it’s time for the final print. For best results it’s recommended to follow the Split Grade process which combines two contrast filters and two different exposition times. The timer filters FILTER A and FILTER B (in seconds) now can be set with the desirable values chosen in test strips. 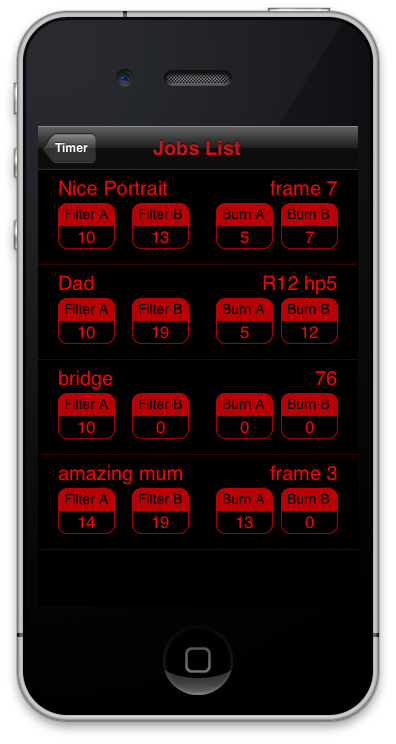 If an extra zone burning in the printing job is needed, BURN A and BURN B timers can be set for each filter. When START button is pressed DarkTimer will play 3 beeps before the countdown, then the enlarger lamp must be turned on until “0” is displayed or you hear a pair of beeps. The timer will reset to original inserted values when you press any timer key, so switching between timers will not loose the values inserted in the stepper. Switch the enlarger contrast filter and click FILTER B button, repeat the exposure process used in FILTER A. Again, the same process applies should you need to do a area burn, using BURN A and BURN B buttons. You can save the printing job clicking on the (+) button at the top bar, where you can also set the parameters used on the enlarger such, filters grades,lens aperture, focal length, enlarger height, notes, roll id, info and notes. To load saved settings you can click the open book button in the top bar, it will allow you to chose any of the previously saved configurations. 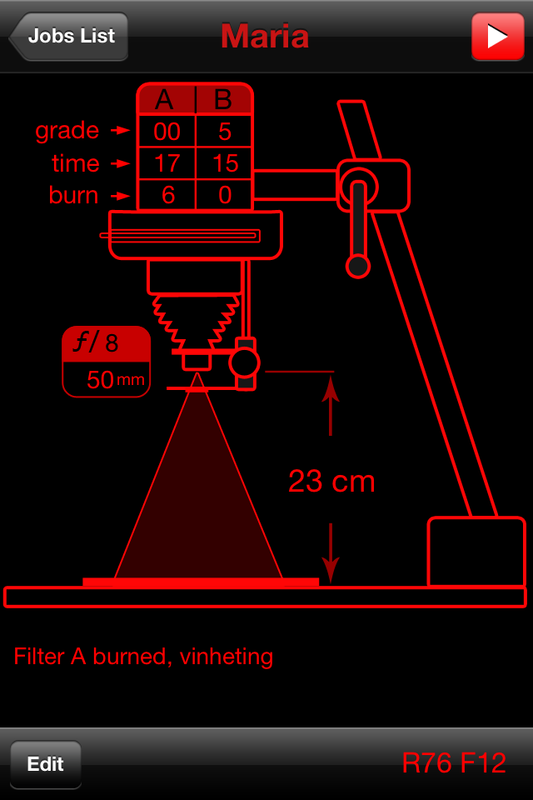 After selecting the job, DarkTimer will display a nice schematic with the all values used in the print process. It’s also possible to edit the job to tweak any setting. To quickly load the Timer with the schematic press the red play button at the top of schematic, Easy. DarkTimer frees the photographer from worrying about multiple timers and allows everyone to master the split grade process. Instead of spending your time looking at timers and taking notes, you can let the App take care of it and focus on the photos. What do you think? Would you use it? I probably would. 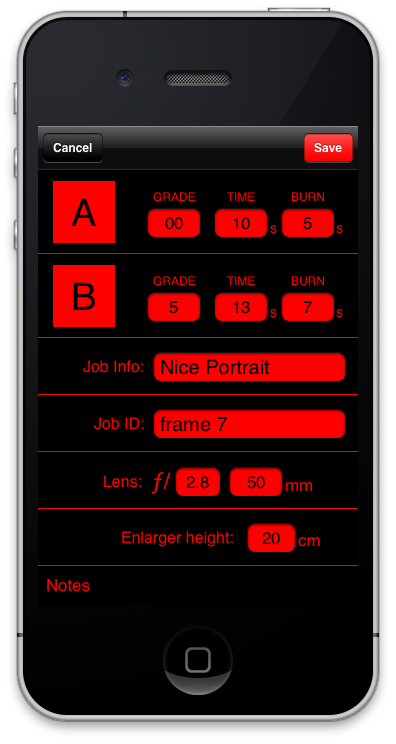 There will be people who have their set rituals with timers, which is understandable, but I think that this little app could be helpful, especially when it comes to teaching how to use a darkroom and how to properly time. What drove you to develop this app? Were others involved? Besides being a developer, I have a passion for film photography, I develop my own negatives and make my own prints in the darkroom. This choice of analog it’s a mater of pleasure, randomness and surprise. This kind of art makes me think and be more envolved in making the photography itself than digital photography. One of the printing techniques I been using in the darkroom is split-grade ( a.k.a. split-contrast), by combining two contrast filters you can achieve a more dynamic range in the paper. The process takes much more time than traditional way, you have to set the manual timer each exposure, take notes, make test-strips, mistakes, etc… so I had this nice idea to make a timer that will help me in the process. About a month, I was developing in my spare time and doing all the process of coding , user interface designing and website building. When is it available for purchase? It’s available since now for iPhone in the Appstore. Does the light from the phone cause any problems with the photo paper sensitivity? Have you had any mishaps with this? Obviously it’s recommended to use the lowest light setting on the phone and to not project the remaining light directly in the photo the paper. The paper’s ISO it’s about 10, so very low to catch any iPhone’s reflection. If unsure, any simple black card paper barrier will block all the light from the iphone. What is your target audience? Teachers, film photographers, etc? My main target is film photographers that use an enlarger to print and have an iPhone. It’s a tiny piece of market I don’t expect to make a big profit, just enough to compensate my time. To purchase Darktimer, click here for the Apple Store. Thanks for reading, as always. If anyone gives this neat little app a test run I’d love to hear about it. Slide Film: What Makes It Different? ← Film Filters : Kickstarter!